In 1 Kings 10:1-13 we read the story of the Queen of Sheba who traveled a great distance to witness the riches and wisdom of King Solomon. After testing him with riddles, she concluded that the king was very wise as well as wealthy; she even declared that Solomon was blessed by his God. Then after abundant gifts were passed around, the Queen of Sheba returned to her land. Archaeology has cast a great deal of doubt on the biblical claims for the size and prosperity of Israel during Solomon’s reign. Some scholars even doubt that Solomon was a historical figure. Could the story of the foreign queen who travels a great distance to praise Solomon simply be a fairy tale? Archaeologists will continue to uncover more information about the size and affluence of Israel during the time of Solomon. 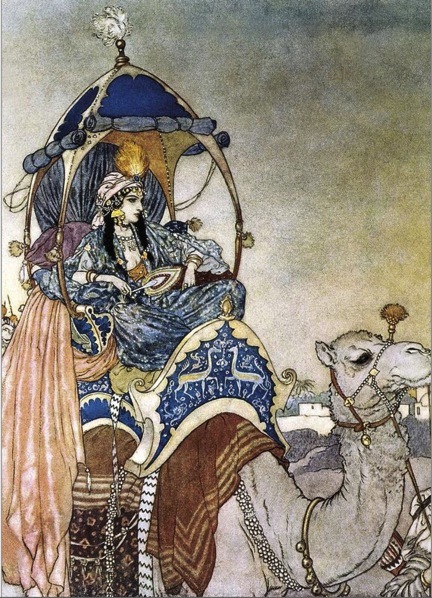 In the meantime, let’s see what we can learn about the Queen of Sheba. Where is the land of Sheba? Although the genealogical records of Genesis 10 can’t be taken too literally, it is interesting to note that there is a tradition in verse 7 which claims that Sheba was a descendant of the black people of Cush (v.7) and therefore the Sabaeans originated in Africa. [See my article about the Cushite wife of Moses for more information about the dark skinned people of Cush]. Another tradition (verse 28) names Sheba as a son of Shem, the father of the Semites. And in yet another source (Genesis 25:3), Sheba is a descendant of Abraham through Keturah which would make the Sabaeans related to the people of Mesopotamia. As a result of these conflicting accounts, there is no biblical consensus about the origins of Sheba. Based on extra-biblical evidence, most scholars have determined that “the distant realm of Sheba in the Hebrew records is to be understood as the Saba of Yemen” (Kitchen, p.128). Assyrian records corroborate that the land of Saba (Sheba) was located in the south-western corner of the Arabian peninsula, roughly the location of present-day Yemen. Archaeology, although limited due to the political climate of Yemen, has found that the ancient city of Marib was the center of an impressive Sabean state which constructed a massive damn to provide irrigation. “The sophistication of the hydraulic planning, massiveness of the stone structures, and very large scope of the irrigated area thus created and maintained show clearly that Marib from ca. 2300 down to 940 BC…we are dealing with a highly organized polity, masters of agricultural engineering, not with some primitive village chiefdom” (Kitchen, p.128). While material evidence of the Queen of Sheba’s existence has not surfaced, a small number of artifacts dating from the tenth century BC (the time of King Solomon) have been recovered in southern Arabia. These contemporaneous relics point to a highly developed culture. In addition, Assyrian and other records note a number of strong female rulers throughout the Arabian peninsula, therefore it is not unthinkable that Sheba could have been governed by a queen (van Beek, p.40). The biblical accounts of the kingdom of Sheba in Job, Psalms, Isaiah, Jeremiah and Ezekiel note that the economy was based on caravan trade in spices, gold and precious stones. The Sabaens had a complete monopoly on frankincense and myrrh, the resins from the species of trees which only grow in South Arabia and just across the Red Sea in Somalia. The resin from the trees was highly sought after by Egypt, the Levant, and Mesopotamia for religious, cosmetic and pharmacological purposes. As a result, these commodities were more valuable than gold, making the Sabaens wealthy beyond compare. Over 1,400 miles from Israel, Sheba was also quite isolated which protected the nation from armies intent on plundering their wealth. “The terrain in between is a barren, almost waterless desert, consisting of rugged mountains near the coast, and a broken, sand- or rock-covered tableland to the east of the mountains. This enormous region is extremely difficult to cross…The coasts of the Gulf of Aden and both sides of the Red Sea are treacherous with coral reefs, offer very few watering places, and were often infested with pirates in antiquity… These conditions made travel by land and sea between Saba and the great empires to the north hazardous in the extreme and had the effect of isolating southern Arabia. Such isolation enabled the Sabaens to fashion their civilization in security, safe from the military devastation visited regularly on northern countries” (van Beek, p.41). Was the Queen an African? For centuries Ethiopians have claimed the queen as their own calling her Makeda. Based on the description of the queen “coming” to Solomon, an expression typically used in the Bible to describe sexual activity, the Ethiopian tradition claims that the two monarchs were sexually intimate. As a result of this union, a son was born to the queen after she returned to her land. All the kings of Ethiopia claim to be descended from the queen’s son. “This royal line, called the ‘Lion of Judah,’ remained in power in Ethiopia until 1974” (Nowell, p.122). There are other reasons for thinking that the land of Sheba was located in the area of present-day Ethiopia. Cain Felder argues that due to racial bias, modern scholars have dismissed the queen’s possible African provenance. Felder is convinced that the Sabaean culture originated in Africa and then it was introduced to the southern Arabian peninsula. Southern Arabia and Ethiopia are separated by a very narrow body of water and there is every indication that the two regions regularly interacted with each other. There is archaeological and written evidence of a close relationship between South Arabia and Ethiopia (van Beek, p.58). Homer described Ethiopia as “sundered in twain.” According to the ancient historian Strabo, “sundered in twain” meant that the Red Sea divided in half a common civilization (Felder, p.25). In the Egyptian records of Queen Hatshepsut regarding an expedition to the region during her reign, it is probable that the combined land of South Arabia and Somalia were known as the Land of Punt. Most scholars have determined that Ethiopic is derived from Southern Arabic and therefore the Ethiopic civilization originated in south Arabia (see for example, van Beek, p.60). However Felder disagrees with this analysis and finds that there is linguistic, epigraphic and literary evidence that the Ethiopians were the first to develop the common language shared by the two sides of the Red Sea. The Ethiopians “became the first to innovate and vocalize the script of a Semitic language, to change and standardize the direction of its writing and use it in manuscripts and literature. It is equally significant that the South Arabians never developed Sabaean much beyond its earliest form, nor were they able to adapt it to literature, as the Ethiopians did…The way the Ethiopians used Sabaean with freedom and originality hardly indicates they borrowed the language” (Felder, p.30). Finally, Felder notes that the early writers Josephus, Origen, and Jerome insisted that the queen was Ethiopian (p.31). Based on my reading, I agree with Nicolas Clapp’s assessment that the Sabaean culture flourished on both sides of the Red Sea. If the Queen of Sheba had ruled the region, both black Africans and Southern Arabians would have been her subjects. Therefore, both constituents must share the claim that she was their queen. When the queen arrived at Solomon’s court she was an impressive dignitary. The Hebrew text stresses the military power of the queen by describing her entourage as “a mighty army.” She speaks with authority as she tests and judges Solomon’s wisdom, implying that her wisdom is equal to his (Reinhartz, p.72). And just like Wisdom in the Book of Proverbs, the Queen of Sheba showers the wise man with riches. “The magnitude of the queen’s gift to Solomon of 120 talents of gold… the quantity specified amounts to over four and a half tons” (Pritchard, p.9). At today’s gold prices the queen gave the king $144.7 million worth of gold! “The image of a wise, wealthy and powerful queen is formed accordingly…she is portrayed as totally independent from Solomon and she has nothing to fear or to gain, which enables her to claim the liberty of free and honest speech…In this encounter he has to compete with a queen, and it has to be proven that he is her equal…Solomon is not the unquestionable great king” (Gillmayr-Bucher, pp.137-8). Nowhere in the story of Solomon did God install him on the throne. Therefore, Gillmayr-Bucher argues, the Queen of Sheba fulfilled the role of the impartial judge who justified Solomon’s reign. “It is because of the Lord’s everlasting love for Israel that He made you king to administer justice and righteousness” she exclaims breathlessly in her final report. It is hard to hear an authentic voice of a foreign monarch in her speech about Solomon’s greatness; rather the words seem to have been composed by a believer in Yahweh and then inserted into her mouth. Whether or not the queen’s genuine words have been suppressed, on the level of the plot she was depicted as being in a superior position to pass judgment. Based on the archaeological record, a strong case can be made for the superiority of the land of Sheba as well. With its vast wealth and monumental buildings, the Sabaeans seem to have little reason for visiting the minor kingdom of Israel. However, Solomon had one advantage: his fleet of ships built by the Phoenicians. The biblical record notes that this fleet called upon a number of ports throughout the Red Sea. Van Beek speculates that Solomon and Sheba had an agreement wherein the queen guaranteed freedom of passage throughout the Sea. In return, Solomon received a portion of the profits for ferrying the valuable Sabaean cargo to Israel and destinations beyond. “It is therefore plausible to interpret the Queen of Sheba’s visit to Solomon as an economic mission whose primary purpose was the conclusion of a trade agreement governing both land and sea routes, rather than as a meeting of mutual admiration as suggested by the Bible” (van Beek, pp.47-8). The last we hear of the queen in the biblical record are the words of Jesus: “At the judgment the queen of the south will rise with this generation and condemn it, because she came from the ends of the earth to hear the wisdom of Solomon” (Matt 12:42; cf. Luke 11:31). In Christian literature and art, the Queen of Sheba maintained a positive reputation throughout its history for the most part. Often in Christian art and literature she is seen as a prefiguration of the Magi who came to adore the newborn Jesus. In folklore she became a slightly sinister figure with webbed feet and hairy legs. In rabbinic and Jewish mystical literature she became demonized right along with Lilith. Both Pritchard and Nicolas Clapp’s books provide lively summaries of her evolution from the heights of wisdom to the depths of depravity in Judaic tradition. She receives a more positive treatment in Islamic literature. However, nowhere has the legend of the queen become more vital and integral to a society’s identity than in Ethiopia. For my part, I prefer the biblical story of a dignified queen who is portrayed as a wise and able ruler. Kitchen, Kenneth – “Sheba and Arabia”, in Lowell K. Handy (ed. ), The Age of Solomon: Scholarship at the Turn of the Millennium. Studies in the History and Culture of the Ancient Near East, V. 11. (Brill, 1997) 127-39.